Reviews - Albergue in Nájera "Nido de Cigüeña"
Thank you for choosing us. We need your help! We will be happy to provide the accommodation to your friends! 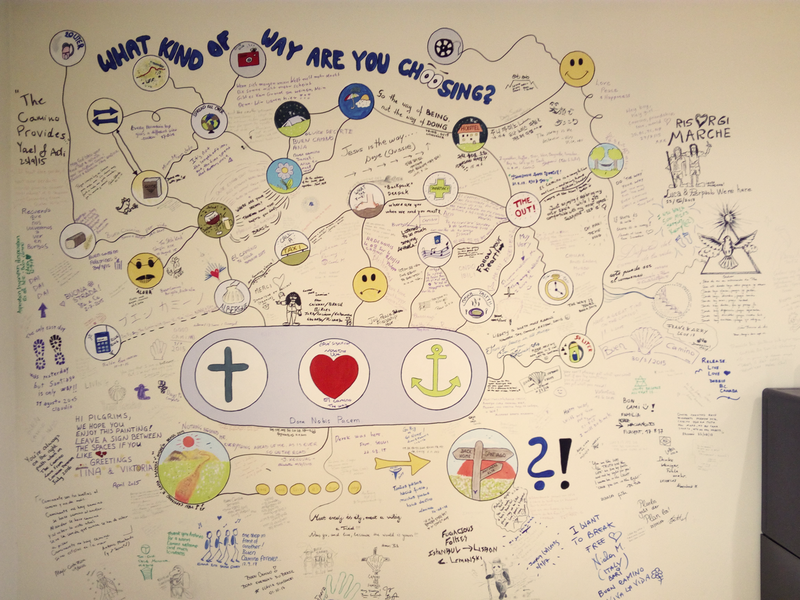 Many of our guests have left a memorial on our wall for other pilgrims or to comeback sometime later and check it. And you can do the same, if you will stay with us! La ubicación es perfecta, céntrico totalmente. El albergue es muy acogedor, agradable, limpio y de ubicación perfecta. Tania ha sido muy atenta en todo momento, sin duda totalmente recomendable. The albergue was superb in all ways. It couldn’t have been in a better location in the oldtown, it was in immaculate condition and the hosts were amazing and so helpful. I will definitely come back and stay here again and can highly recommend this place to anyone who wants to stay in Najera. The family running the place were very welcoming and kind. They seemed very passionate about providing a great experience for their guests. It is not a big albergue, it was perfect for me – very clean, safe, and easy to find. This would be a perfect stay if it wasn’t some kind of fiesta and a little noisy outside. I can’t say enough of how perfect our stay was here! The owner welcomed us and showed us everything we needed to know. The rooms are super clean and very cosy! We were a couple, but even with a child it could be great. Minutes away from the monastery. You have to go at “El buen Yantar”, a great restaurant very near to the albergue. It was our best meal in 8 days in Spain, for a very reasonable price. I fell in love with Najera, and will definitely book here if i have a chance to come back. A compact space with everything you need for a stay. Minutes from bars, restaurants, culture and everything else Najera has to offer. Hospitaliero is very easy to communicate with and arrival and leaving simple. A very nice albergue – comfortable bed, soft blanket and superb shower. We enjoyed our stay, thank you so much! Вся моя благодарность и уважение этому островку настоящего русского гостеприимства на пути Сантьяго. Процветания вам, изобилия и счастья! Hemos estado casi mejor que en casa! Muchas gracias. Thank you, Anthony. Lots of comfort, peace and clean space. Quería aclarar que mi opinión de abajo era sobre el Albergue El Peregrino, no Nido de Cigueña. Muy recomendable. Tiene pequeños detalles que te hacen la vida más fácil, como perchas en las camas, mesas entre literas, cortinilla en la ducha para tapar la ropa. Una cocina más que suficiente y pila para lavar a mano. Además dormimos sin ruido y muy tranquilos. ¡Muy buen albergue! Thank you for this nice albergue 🙂 Greetings from the german brothers! Because of the holidays the town was very busy and exited. Big enjoying and good resting. Thanks God! Peace will be with you, guys! Gracias! Un lugar perfecto para poder dormir tranquilo. Nice rooms, good atmosphere. We will be back! We stayed here in Sept. 2014. Very very good. If ever I have the opportunity to walk thru there again, this is the place I will stay. Thank you for your warm words! 🙂 We wait you next time. A very clean, tidy, modern and friendly albergue. Really enjoyed our short stay and the quality of the facilities. Ваш приют оставил приятные впечатления домашнего уюта! After our longest day it is a great place to stay. We were welcome. Plenty of space and very friendly. A very pleasant hostel! Thank you very much. Very nice and clean place. The house has a soul. This is the best albergue we have stayed in on the Camino! Many thanks to Edward! So clean and beautiful. We recommend this to everyone. Edward was so kind and helpful. Thank you! Very nice, clean and quiet place. My girlfriend and I loved it. The garden outside it’s perfect if you want to relax after a long day! The kitchen it’s big and comfortable! Thanks for the nice and clean accomodation. It was a great day! Albergue perfetto per riposarsi e riprendersi dalle fatiwe del cammino, e ora pronti, via per l’ultima tappa, fino a S. Domingo. Un placer descansar en este albergue. ¡ Buen camino a todos! Wonderful welcome and so clean! Thank you from Ireland! Lovely hostel, we rested well here. No noise. Refreshed and ready for the road. To all enjoy your experience on the way of Saint James. ¡Excelente albergue! Servicios, calidad, limpieza y atención… Máxima nota. ¡Me encanta! ¡Lo recomiendo a todo el mundo! Les deseo la mejor suerte en el futuro. El albergue muy moderno, estaba muy feliz, pero muy cansado. Estupendo albergue. Gracias por la comodidad, la limpieza y la acogido. Mucha suerte! Beatriz y Sofia. Estupendo en trato y limpieza servicios. Somos unos abuelos con el nieto de 13 años y un amigo de Asturias. Gracias por atención exquisita. Muchas gracias por el buen trato y el lugar tan limpio y cómodo. Lo disfrutamos mucho. Saludos de Jan, Oriana, Pablo y Kiki desde México. magnifico albergue, han sido muy hospitalarios y amables, con calidad, buen servicio, todo estaba limpio y nuevo,… un 10. absolutamente recomendable. El restaurante El Buen Yantar es el mejor restaurante para comer en Najera. Menu de peregrino por 9 euros, con ampllia variedad de entrantes, segundos platos y postres de gran calidad y muy abundantes. Sin duda, lo recomiendo. Great place. Clean and comfortable. The couple in charge are extremely helpful. I cannot forget an awesome shower. Close to them, you can find a great place to have a meal, El buen yantar, grilled meat, good wine… at 9 euros. We will come back once we finish the way. Magnifico Albergue, encantadores en el trato 100×100 recomendable. Very pleasant and nice albergue. New, small and cozy. The best along the camino. Eine gemuetliche und aeusserst saubere Herberge mit sehr freundlichen Hoitaleros. In jedem Falle empfehlenswert. Nicht direkt die erste Herberge auf dem Camino, aber wirklich nicht weit von der Innenstadt. Eine sehr schoene Herberge, sehr nette Gastgeber und super sauber! Fuer die Betten werden frische Ueberzuege berteitgestellt. Sehr zentral gelegen in der Altstadt und direkt am Camino! Ein Gluecksgriff, da die Herberge sehr neu ist und noch nicht in den Reisefuehrern steht. Eine sehr saubere albergue die noch sehr neu ist mit kleinem Garten und Küche, verschiedene zimmer großen vorhanden, ich fand es wirklich super hier kann man nur weiter empfehlen. Muchas gracias! Un albergue acogedor, muy limpio, con buen jardín y vista a la montaña. Mui bello albergue! Gracias po todo. Suerte!!!! Amigos brasileiros Ana y Paulo. Excellent albergue. Very clean. Good kitchen. Gracious host. Highly recommended.